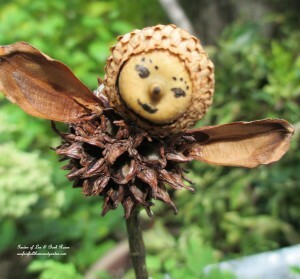 monkey ball fairy … an inexpensive DIY project! 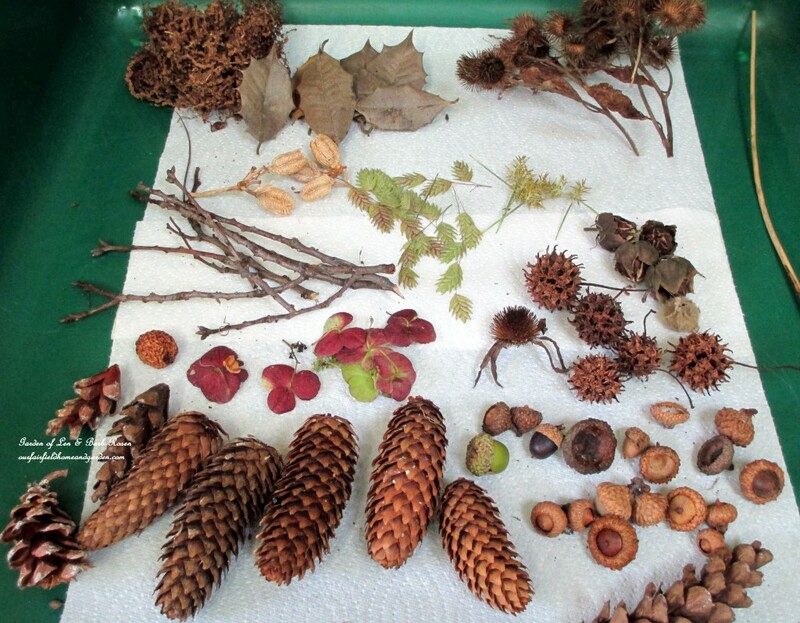 This morning as I was taking a stroll around the neighborhood and our yard, I gathered little bits of leaves, acorns, monkey balls, sticks and grasses. 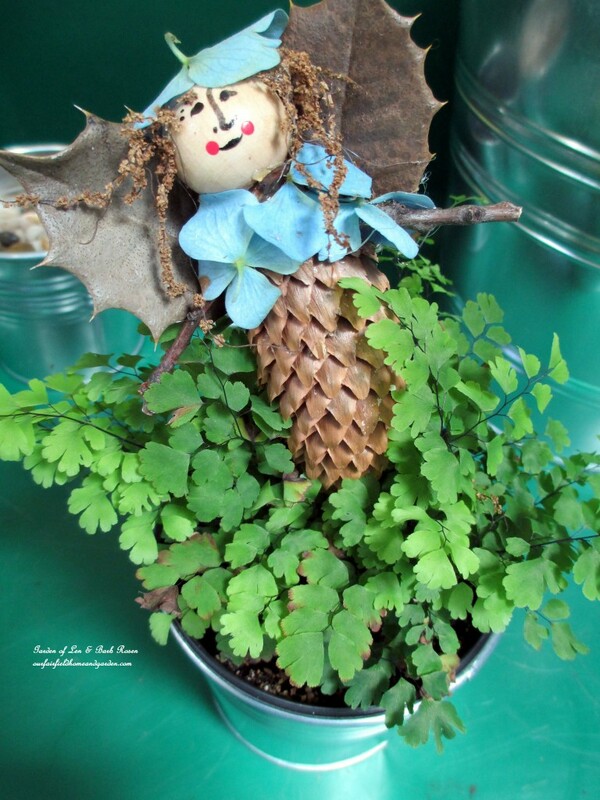 Since buying fairies for my plants and garden is pretty pricey, I decided I would try my hand at making my own! 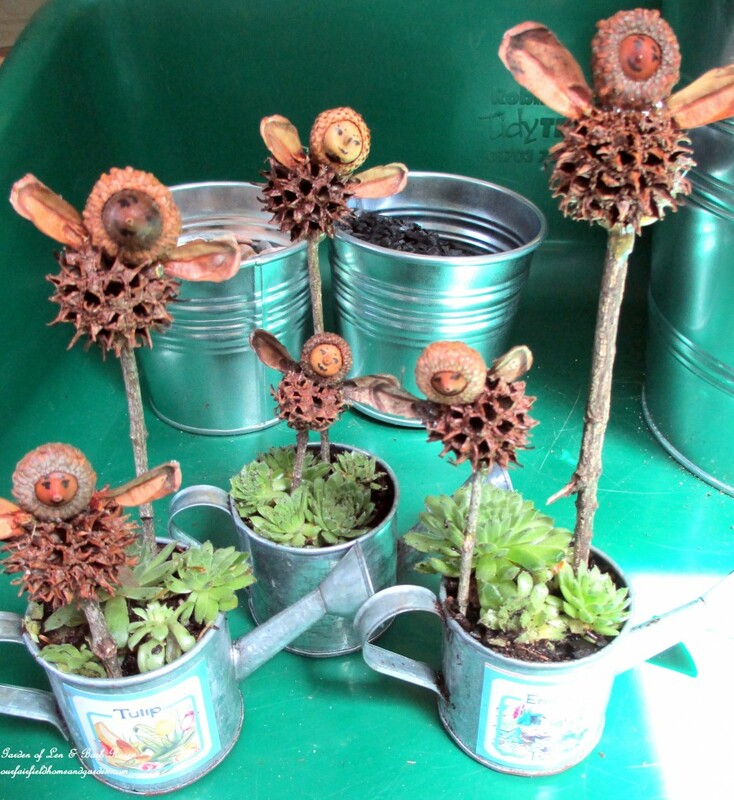 Plus, the Arden Fair is next Saturday and I wanted something different to contribute to our Garden Gild’s booth. 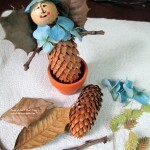 First, I decided to make a Pinecone Fairy and assembled the found materials and heated up my hot glue dipping pot. 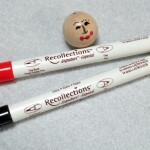 Then I drew a face on a wooden bead and let it dry. I glued the head on first, then placed little hydrangea petals around the neck area. Stick arms and holly leaf wings were attached next . Some grasses were the finishing touches of skirt and hair. 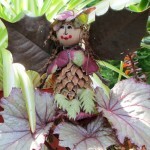 Finally, a longer stick was glued to the back of the fairy ‘s body so I could use it as a plant “poke”. Now I was on a roll! 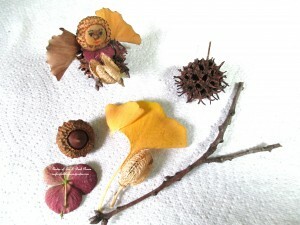 I used monkey balls as the body and drew little faces on acorns, which became the fairy heads. Ginkgo leaves and disassembled pieces of a pine cone (scales) became wings. 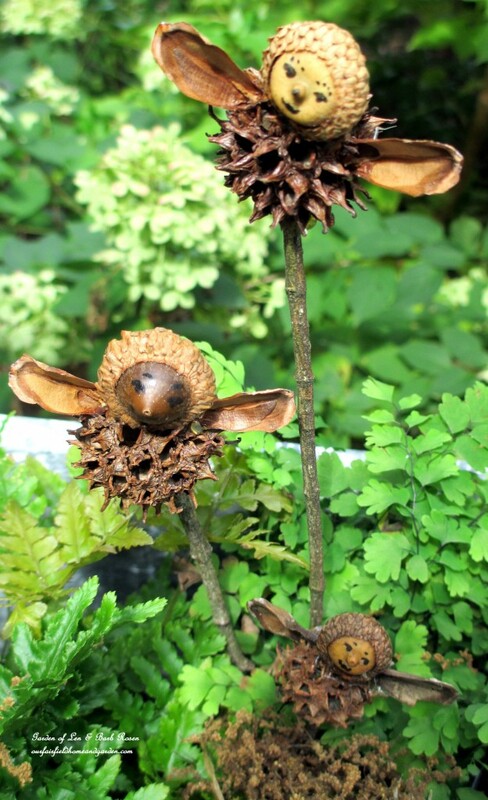 I ended up making three pine cone fairies and eight monkey ball fairies to poke into plants I was donating to the Arden Fair Garden Gild Booth. All this project cost me was a few wooden beads, some hot glue and my time. Another of my “use what you have” ventures that I am very satisfied with! 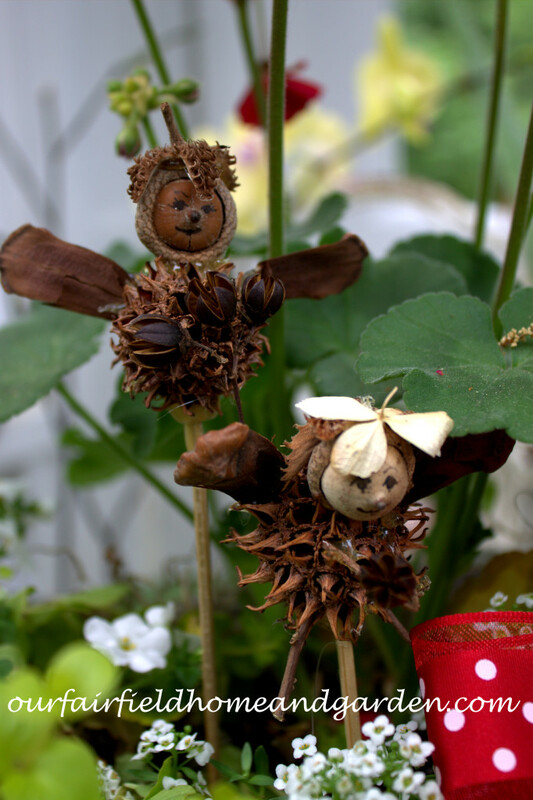 I hope you’ll also create fairies with found natural materials from your yard and have as much fun as I did this morning. finished monkey ball fairies … I decided to make some extra ones just for me! Fairy Plant Pokes perk up a container planting! 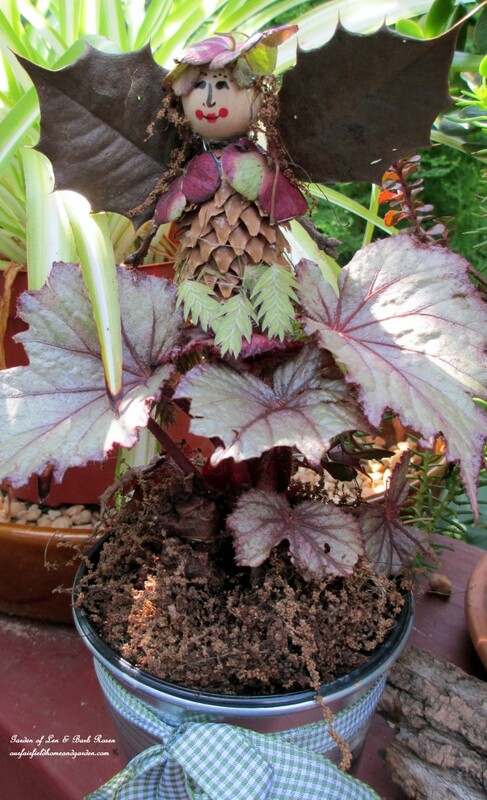 I too live in Fairfield and am a gardener, remain very interested in your display, very nice and creative. Thanks for writing, Patty! We live on Fairfield Drive (hence the name Our Fairfield Home & Garden) in Wilmington, Delaware. Happy you are enjoying my posts. Are you in Delaware, Virginia or someplace else all together? Thanks so much for stopping by and your lovely compliments, Deborah! I hope you’ll come back again soon!